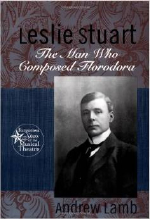 Leslie Stuart (1864-1928) was a British songwriter best remembered as the composer of the hit show, Florodora. He began writing popular songs as a teenager, first for blackface and vaudeville performers, and eventually for more "legitimate" shows and revues. Florodora (1899), written in collaboration with London's most fashionable librettist, Owen Hall, was a musical-comedy sensation. Its combination of the traditional slow love ballads and waltzes with more rhythmic and long-lined numbers made it a worldwide success. He continued to compose through the first decade of the 20th century, laying the groundwork for the coming innovations in British and American musical theater.